Ireland Under-20 back row Azur Allison says the rapid rise of Jacob Stockdale is a massive inspiration for the current crop of youngsters looking to make the breakthrough on the national scene. Ireland, sponsored by PwC, are at home to England in their Under-20 Six Nations opener in Cork next Friday evening. The 19-year-old will miss the clash with last year’s World Rugby Under-20 champions finalists due to a groin injury but cannot wait to make his first appearance at this level. 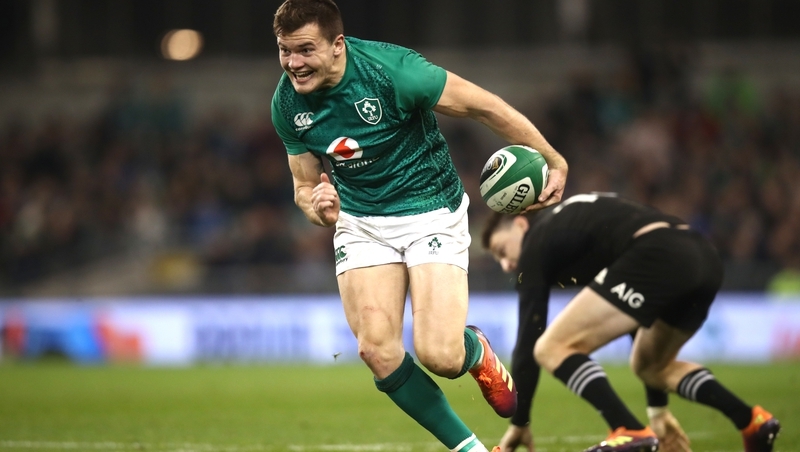 “I remember watching the Junior World Cup where Jacob was playing 15 and now he’s scoring tries for fun on the wing for Ireland,” said Allison. “It’s a real visualisation of what you can do or what’s possible. There’s plenty of other guys who are only one or two years out of 20s rugby and they’re starting to push into the senior team. “These will be the first games that I will be involved in that will be televised. There is so much buzz around it. It’s definitely a really good opportunity to show yourself in the international side. No 8 Allison signed up with the Ulster academy this season after he captained the Ireland Under-19 against France and Japan last term. He is joined in the Ireland Under-20 squad by fellow Ballymena clubmen JJ McKee and Bruce Houston. Ulster are also represented by David McCann, Iwan Hughes, Angus Kernohan and Stewart Moore. Former Ulster and Connacht scrum-half Kieran Campbell has been drafted in as defence coach. “It sort of adds a wee bit to it. You’re all in it together, coming down from Ulster,” said Allison. “Then at the same time, I’d say a good majority of the squad has played together, whether it be 18s or 19s. There is a good sort of collective buzz around the squad already. It’s definitely a wee bit extra when you’ve your club-mates and your provincial mates as well. “I’d know Kieran Campbell quite well. Very driven. He likes to get the most out of people, which is a given for any coach really. “He’s really leaving it up to the players to make decisions themselves and see where they can do better, or what they’re doing well and need to work on.